As part of what he calls a "road trip" to China, Apple CEO Tim Cook on Wednesday tweeted out a photo of himself sitting with a Foxconn worker putting the finishing touches on a new iPhone 6 model. As seen in the photo above, the Apple chief is apparently doing some legwork in China outside of his talks with the country's vice premier, and one of the first stops was Foxconn's iPhone factory in Zhengzhou, where he met with assembly line workers building the latest iPhones. 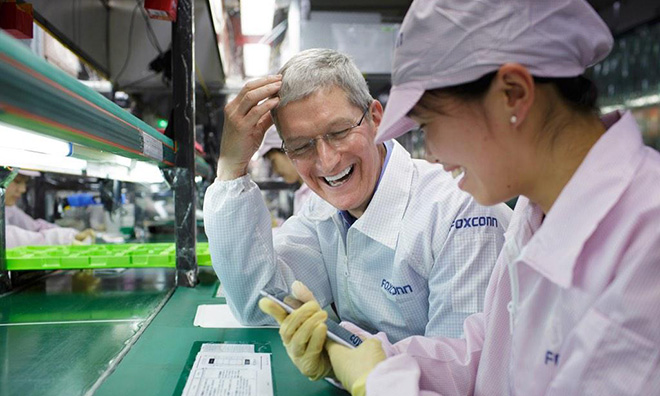 "Great to meet talented people like Zhang Fan, who helps make iPhone 6 in Zhengzhou," Cook writes. "An early highlight of this trip." Cook is reportedly scheduled to meet with China's Vice Premier Ma Kai in Zhongnanhai, a government complex in Beijing, to discuss recent targeted attacks on iCloud originating from the country. An activist group called GreatFire.org alleges Chinese government involvement. As for the Foxconn plant, Zhengzhou is known to be a critical point in Apple's iPhone supply chain. During Apple's quarterly conference call for the three-month period ending in September, Cook said that iPhone 6 demand is far outstripping supply, suggesting that at least one reason for the trip may be to check on production progress.